The key to fitness is dedication, patience, and intense workouts. Right fitness accessories can help to increase the productivity. Blender bottle can be your right fitness accessory which can help to improve for the same. Here are some top 10 Blender bottles. The Pro45 has a capacity of storing 45 ounces. It perfectly blends shakes, smoothies, protein shakes and more. The blender ball is 50 % heavier than the normal blender ball. The Pro45 comes in combo color of Grey and Blue. The Pro45 manages to get in the number ten position because of its high-quality material which is BPA- and Phthalate-free. The bottle has a total storing capacity of 21.5 ounces and has 2 extra storage compartments. This unique bottle is well designed and has high-quality material which is BPA, BPB, Phthalate free. It has a pill tray which makes the product 3 in 1 mixing shaker bottle. Pre and post workout shakes can be filled inside and moreover can also store vitamin or protein pills in the pill tray. 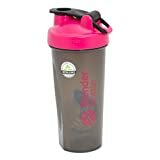 This Blender bottle has the capacity of storing 28 ounces and the special blender ball is made up of stainless steel. The stainless steel eventually increases the durability and effect of the ball. Moreover, the color of this bottle is a brand new exclusive one which again has a high-quality material used and it is BPA free. The attractive part of the bottle is its black translucent color and its incredible blending power. 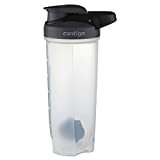 The Contigo bottle has a simple yet impressive design which has a capacity of storing 28 ounces. It is cheaper than other products on the list. It has a roundup – round bottom design specially designed to reduce the clumps and for easy cleaning. It has a leak proof lid and features volume markings for easy measurements. It has a BPA-free material. 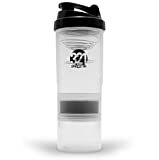 It is a dual shaker cup with a storage capacity of 28 ounces. The Lid is leak proof and is assembled, designed and manufactured in the USA itself. It can be called as pure Amercian made product which has a premium quality material used and is a BPA free. The unique design has two segments called as Prime and Recover which helps in taking the necessary mouthful drink for the pre-game energy and post-game recovery respectively. 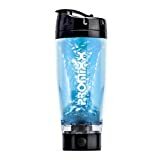 As the name suggests the product is 100 % leak proof and has special X-blade technology with a capacity of storing up to 20 ounces. It is a battery operated mixer which eventually makes the blending and mixing effortlessly. The material of the bottle is BPA. DEHP-free. Add detergent and water to the bottle and switch to the water for simple cleaning. The bottle has the same dual grinding feature, with two segments. Each side has to store capacity of 14 ounces. It is leak proof and also has pill container. Moreover the same feature of Prime and Recover but with available in an exclusive color combination of red and blue. It is 100 % American product which is BPA free material. 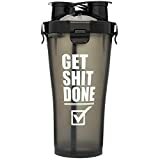 It is a multi-storage Blender Bottle. Prostak has a capacity of storing up to 22 ounces. The stainless steel blender ball blends the ingredients well. It has a fully independent jar system for storing your supplements. The unique loop makes it easy to carry around. It also has pill container. The total storage capacity of the product is 28 ounces and has high-quality material which is BPA free. The product is odor resistant and the stainless blender ball blends the ingredients well. The bottle is durable and the most reliable one on the list. Sports grip makes it easy to carry the bottle around. It has a premium rich design which is perfectly designed as the best companion of the athlete. The Classic Blender is extremely cheap with all the great features and qualities which a blender bottle should have. The material is of high quality and is BPA, Phthalate-free. The storage capacity if of total 28 ounces and has a stainless steel blender ball. 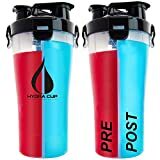 Most of the blender bottles have the same features yet with different design and look. The hard ingredients are supposed to blend with ease. The cleaning is also easy is dishwasher safe. There are lots of varieties of blender bottles in the market, but these few bottles have the best and efficient results. The Products are in the list because of various factors such as quality of material, price, features and user experience.